Nearly 50 years ago, a young student from Virginia Beach took an elective art class at Mary Washington. Although she eventually chose to major in psychology, Elizabeth "Lloyd" Tilton Backstrom '61 today says that art appreciation class made a lasting impression. "I'm not an artist, but I have used the lessons I learned from Dr. Pauline King to appreciate art my entire life, and it has carried through in my travels and in our personal art collections." After graduation from Mary Washington, Lloyd worked for Reynolds Metals Company and IBM, and then she married businessman and entrepreneur, Art Backstrom. Throughout her life and travels, Lloyd says she was always fond of Mary Washington, but did not stay in touch. At the prompting of an elderly relative, she says she finally saw the importance of reestablishing connections with her classmates and alma mater for one of her reunions, and she has enjoyed every moment since. For her 45th reunion class gift in 2006, Lloyd and Art donated a painting titled, "Plums Still Life," by Julien Binford, the well-known artist who served as professor of painting at Mary Washington from 1946 until 1971. Recently, they notified UMW of their intent to bequeath their entire private collection of Binford paintings, in addition to a portion of their overall estate. "My time at Mary Washington was absolutely a life-changing experience for me, and I loved every minute of it," she says. 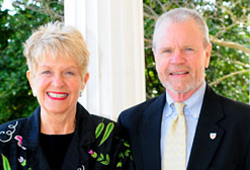 "I hope our gift will have a lasting impressions on UMW students."